Constructed in citronnier, ebony and harewood, and dressed with a porcelain plaque in the ‘Sevres’ manner, and adorned with very fine bronze mounts. 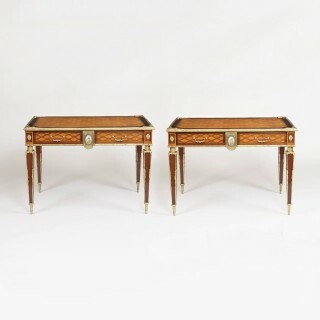 Throughout, the ‘trellis and dot’ inlay, indicative of Ross’s work, is employed: rising from stylised foliate toupie feet, the tapered and waisted legs have gilt bronze collars, and the apron houses two mahogany lined drawers with quadrant mouldings, with betwixt, an elliptical bronze plaque frames a putti; gilt bronze paterae dress the angles. Stamped to the right hand drawer, ‘Edwards & Roberts’, who almost certainly retailed the piece. Donald Ross, of 13 Denmark Street Soho, London, specialised in fine inlaid furniture in the Louis Seize manner, borrowing liberally from the design oeuvre of Jean-Henri Reisener. He was exhibitor number 107 at the Crystal Palace Great Exhibition of 1851, when he was working from 11 Norton Place, Edinburgh prior to his move to London. 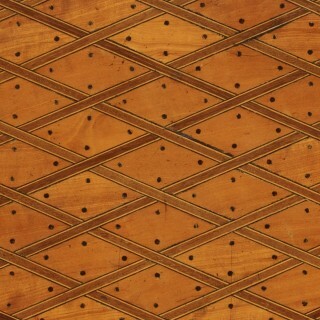 The Victoria and Albert Museum, South Kensington, London possesses a pair of tables in this distinctive ‘dot & trellis’ inlay work. 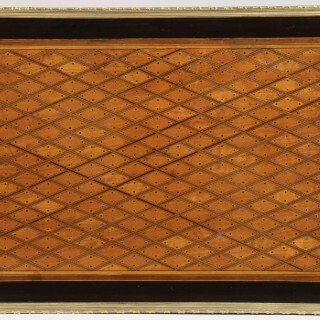 A similar table is illustrated in Christopher Payne, 19th Century European Furniture. Woodbridge: Antique Collector’s Club, 1985; p. 315 (pl. 972). 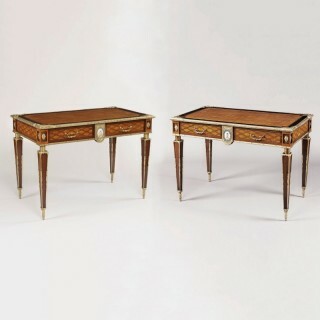 See also Christopher Payne, European Furniture of the 19th Century. Woodbridge: Antique Collector’s Club, 2013; p. 291 (illustrated).